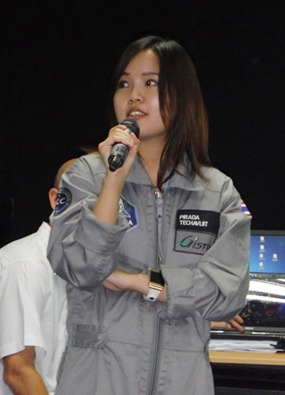 On Thursday, June 22nd St Andrews was proud to welcome Pirada Techavijit – as our guest speaker – who is poised to become the first Thai person in space. Pirada, a satellite control engineer at the Geo-Informatics and Space Technology Development Agency, is one of only 23 people chosen from across the world to make the trip into space. Dressed impressively in her flight suit, Pirada shared some insights into her educational background and the selection process she went through to qualify to travel into space. Students were fascinated by her story, particularly when she described the training she received including the G-force simulator! Not only did Pirada share her story, she was also happy to pose for photos with enthusiastic students and even sign some autographs. St. Andrews students enjoy having their photo taken with the Pirada. Thank you so much Pirada, you are a real inspiration. We wish you all the best for your trip into space and look forward to welcoming you back when you have completed your journey. Pirada talks about her future mission into space.